Welcome to the Sanctuary. A haven dedicated to your wellness. A place of refuge. A place to heal. A place to grow. A place to transform. For us, our purpose is to bring you lifelong health solutions using preventative and restorative techniques in a caring and professional environment. The Sanctuary believes in providing essentials for a healthy body both internally and externally, using natural methods that are chemical-free allowing you to take responsibility for your own well-being. These unique and personalised holistic services encompass nutritional guidance, lifestyle enhancements that incorporates plant concentrates, educational workshops, restorative bodywork and many other life-changing improvements all designed to do one thing -- to assist your body in rediscovering its own powerful inner intelligence. Meet with one of The Sanctuary’s certified Meta-Clinical Aromatherapists for an initial personalised consultation to assess your needs, where a wellness program is tailored specifically to you. The Sanctuary’s Therapeutic Bodywork takes a non-invasive, holistic approach to maintain the body's natural functions. This style of therapy, which includes Lymphatic Drainage, Body Balancing treatments among others, are steeped in centuries of tradition that is vital in supporting general physical and emotional well-being. Lymphatic Drainage: Sanctuary uses a unique Lymphatic Drainage therapy technique to stimulate the flow of lymphatic fluid around your body. Your lymph system is your body’s first line of defence against disease and infection. By promoting fluid circulation and decongesting the lymph nodes, manual lymphatic drainage helps boost the immune system and detoxify the body. Body Balancing: Body Balancing is a combination of techniques including acupressure points, meridian lines, deep tissue and Gua Sha to promote energy flow with the help of therapeuticgrade essential oils. The techniques used brings balance to the body in a non-invasive manner. It also stimulates the body systems in a physical and emotional level. Therapy is tailored and assessed according to the individual needs. The AromaDome® is revolutionizing the aromatherapy world. It provides a whole new way to utilize the inhalation of therapeutic-grade essential oils in a custom designed, contained environment. This tenting session allows for intensive inhalation which optimizes and enhances their effects supporting the respiratory, circulatory, and immune systems of our body. Direct inhalation is the quickest pathway to the limbic system, also known as the emotional center of our brain. Did you know that out of our five senses, the sense of smell is the only way to influence emotions and behavior? The brain registers scent twice as fast as it does pain. This has a powerful effect on transforming the body, mind, spirit. Specific essential oils are selected to support respective individual needs. Each session can last 15-30 minutes. After a client completes a Lymphatic Drainage therapy session, they will then experience the next level of detoxification sitting in a Far-Infrared Sauna. This further assists the body in removing cellular wastes that have been collected around the lymph nodes. Clients can also utilize this treatment separately for pain relief, weight loss, skin rejuvenation, and relaxation, among many other health benefits. The Sanctuary will be offering certification courses throughout the year. Regular educational workshops on various topics will be conducted to create an enlightening and rewarding experience for the community. Both our Yoga and Meditation classes incorporates the use of therapeutic-grade essential oils in your practice so you can become more alert, receptive, connected, grounded, centred, uplifted and present. Meditation has been practised for thousands of years and is a tool for rediscovering the body’s own inner intelligence. By combining essential oils with yoga and meditation, it makes your practice more potent for healing and centering. Check with us for the schedule. Schedule an appointment with one of The Sanctuary’s consultants who can provide valuable insights to overhaul yours and family’s health and lifestyle — from chemical free products, healthier food options, healthy habits, to personal care that are all natural and plant based solutions. Gua Sha is a healing technique based on Traditional Chinese Medicine that has been practiced for thousands of years. Gua Sha stimulates the flow of qi and blood within our meridian systems. It can be used to prevent diseases and strengthen the body. It’s helpful for a variety of health conditions as well as beauty purposes. This Crystal Gua Sha is hand-made by a Doctor containing real jades and crystals to help tune our own internal self-healing mechanism, promotes circulation in the body, stimulates the immune system, improve the lymph flow, removes blockages and pain, balances organs and functions, detoxifies, revitalises and regenerate our cells, reduce stress and attune emotions, relaxes and most importantly promotes a healthy state of being. Your immune system functions at its optimum when your body has enough supply of electrons. This can be simply achieved by barefoot contact with the Earth. Throughout history, humans have spent much of their time outdoors than we do in the current modern society. Now we live in houses, wear rubber or plastic shoes, and are constantly exposed to EMF (Electro Magnetic Field) on a daily basis with hardly any contact with mother Earth. Whenever we are disconnected from the earth we tend to feel fatigued. By re-connecting with the earth we are able to restore balance in our bodies. Modern science has documented the connection between inflammation and all the chronic diseases. Research studies have shown many benefits of earthing (or grounding), which includes reducing inflammation and pain, decrease stress levels, improving sleep, stabilises the central nervous system, improve blood pressure and flow, speeds healing and shorten recovery time from injuries or intense activity, relieving muscle tension and headaches, eliminate jet lag, increase energy levels, balances hormones, among many other benefits. One of our modern day solutions is to sleep on special bedsheets such as the Earthing Sheet, which is connected to the Earth’s energy. Far Infra-Red (FIR) Sauna is a full spectrum wave within the infrared region that is readily absorbed by the body providing a range of health benefits to the users. When FIR is absorbed, heat is released to the surrounding tissues. This warms up the body, improving blood circulation and soothes body aches. The rise in body temperature stimulates perspiration and purges toxins out of the body in the process. Users will feel rejuvenated after each session. The FIR Sauna allows you to absorb the best and most nourishing light waves that our sun has to offer in the far infrared spectrum, minus the harmful ultraviolet (UV) radiation. Benefits include pain relief, reduce toxins, weight loss, rejuvenates the skin, and relaxes the mind. We went for a talk in Jakarta on a whim because my daughter and I were free and it changed our life completely. For someone who had crystal clear skin all throughout she suddenly had full blown acne. I had taken her to skin clinics in Jakarta and Singapore but nothing worked. When we went for the talk and the conversation led to “…if you have these symptoms you have a weak liver…” We did a consultant just to confirm what we had already suspected and that changed our lives. My husband did have a really bad stomach, a constant cough and acidity issues. After a consult he was told to turn Vegan for 6 months. He followed the given protocol completely and since then has never had stomach issues even when he does eat normally now. I did a personalised protocol for 6 months and noticed my skin has improved, and also generally feel better. I realised I don’t need my reading glasses anymore. I also did the 12 day cleanse in May 2016 and I must say although it was a bit inconvenient to sit at home for those 12 days I felt FANTASTIC after that and am contemplating doing it again! I just would like to say that although we all fear the unconventional we should all give it a try. At least once.. And if you are a sceptic try it out with something easy and see if it makes a difference in your life. I think everything happens for a reason and meeting up with the team in Jakarta was absolutely fantastic for us! I was diagnosed with asthma and allergic to the air if it’s too hot/cold/dusty/smokey/some foods. I’ve suffered from coughs since I was 5 months old, and I’m 46 years old now. I was often treated in hospital for asthma attacks and have been to ICU in critical condition. The drugs I was taking was not helping my asthma attack either. My weight kept increasing because of the medication containing steroids. The fatter I became, I had more frequent shortness of breath and relapse. I’ve tried traditional medicines and advice of friends and relatives, none of which have helped relieve my pain let alone cure. The older I got, the worse my asthma became. Stress, emotional, physical fatigue can be additional triggers that made me relapse everyday. Flu and strep throat would cause me to have a huge attack and be rushed to the ER. Almost every month I spend so much money that does little to seek treatment. Even walking for 10 meters leaves me breathless. Every night while sleeping I always have shortness of breath, up to 5 to 6 asthma attacks. Every morning I wake up with headaches because of the attacks every night. Everyday I carry Berotec spray and would have to use it every hour. I have tried yoga, pilates, medications from Singapore doctors and herbal medicines. All was not successful to help me. Until one day I met Stephanie to seek help for my condition. She advised me on some simple protocols, as I was determined and desperate to follow through. Since June 8th 2016 until today, after only less than 2 months since following Stephanie’s advise, I have never used the spray or take my asthma drugs again. At night time I have not had any attacks or shortness of breath. When I’m among family who smoke, I’m completely unaffected. My family are all surprised to see I’m no longer puffing with my Berotec spray. My goal is to completely cure asthma and reduce my weight so I will be healthier. Currently I am very pleased to introduce The Sanctuary to friends and relatives, especially those who are sick. Thanks Stephanie for encouraging me to believe in myself, and very patiently helped me with guidance and advice. When I met the team back in February this year, I went in with a plethora of complaints, common symptoms experienced by many these days. Constant fatigue regardless of how many hours of sleep I get, deteriorating eyesight, skin allergies, difficulty sleeping, all the symptoms that can be attributable to high stress work and lifestyle. I’ve been to several doctors with regards to my eyes. Since young, I have always had bad eyesight. I started wearing glasses when I was 10 and at 16, switched to contact lenses. When studying in the States, I began to develop allergies, primarily hay fever during the spring season when pollens are abundant. My eyes would be the first to act up, and for almost the entire spring, I would be wearing thick glasses. I am severely myopic, minus 8 to be exact. So my glasses are heavy and uncomfortable to say the least. Recently, I frequently have conjunctivitis as a reaction to contact lens wear. My doctors told me I have to consider stopping contact lens wear and switch to glasses or have lenses implanted into my eyes. None of these options are appealing to me. Following the team’s prescription, I saw my vision improved drastically even after a short 2-3 months. My world seems to be brighter, sharper and clearer—I constantly am amazed at what I see these days (This must be how those blessed with 20/20 vision sees the world! I thought to myself ). Anyway, I am happy that I can wear my contact lenses daily without reactions these days, and I suspect that my prescription has changed since sometimes the vision is so clear that I get dizzy? I have not checked my prescription yet but I will continue to follow the team’s protocol. Other than vision improvement, I feel more energized these days, I sleep well at night and wake up refreshed. Also, I used to have little bumps on my arms that many dermatologists were unable to cure. Sometimes, it was misdiagnosed as a form of eczema. I learned later after numerous visits to various dermatologists, that it actually is keratosis pilaris. Anyway, at some point, I gave up and learnt to accept this as something I have to live with for the rest of my life. Now, I am happy to say that the unsightly bumps are gone but the scars still remain. I am hopeful my eyesight will continue to improve and will continue to follow the team’s protocol. Thank you team for introducing me to a bright new world! I will forever be grateful for Stephanie to introduce me to a new world of living. Having these precious therapeutic plant-based remedies in my life, have helped not only me, but my family and friends about how we feel everyday! Living abroad, it provides a great way to balance healthy living, natural medication and regimens of beauty. Stephanie has been there to consult me along every step of my way and has been giving me invaluable advice for any situation that has come up. It's a blessing to have such a health coach, that educates passionately and cares for people's health, wellbeing and happiness from the bottom of her heart! Thank you Stephanie, for making a difference for so many people - and having the new Sanctuary available is not only an incredible benefit for all of us, but a true celebration of nature's gift to us. I had melasma for 6 years. I've been following the advice of the team using natural therapy daily. After 2 months the melasma’s black and redness had reduced by 40%. After 4 months it has reduced by 85%. Now the redness is hardly noticeable. During this time I also did 10 sessions of Lymphatic Drainage treatment by JP to help release the toxins, which I felt was equally as important in the process to help clear my complexion. My Aesthetic doctor was so amazed what have I done. I have spent thousands of dollars back and forth for treatment and never saw any improvements. I am so happy with the results that natural therapy has done for me. I have been struggling with migraine for more than 10 years. I am very easily prone to migraine especially when I don’t get a good night’s sleep, when I’m stressed or tired. And because of that, my immune weakens and I would get sick for a couple of days. This cycle happens at least once a month. I have tried all kinds of conventional methods without any significant progress. I met the team at Sanctuary about a year ago and religiously followed the given protocols. I also did therapy and I find that it helps boost my recovery process. My symptoms have drastically lessen in 3 months time and I am definitely a lot happier now. We are proud to be affiliated with the following organizations! 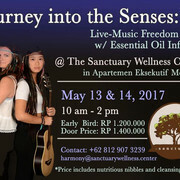 please call: +62 21 3162452 , email us at harmony@sanctuarywellness.center or use our Contact Form. © Copyright Sanctuary Wellness Center. All Rights Reserved.